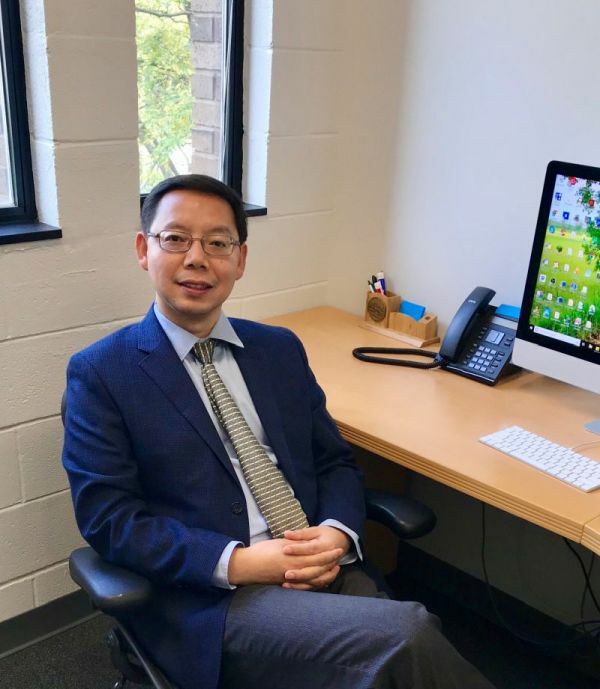 I am an Associate Professor at Department of Biomedical Informatics and Department of Computer Science at Stony Brook University. I received my Ph.D. in Computer Science from University of California, Los Angeles, and M.S. and B.S. in Engineering Physics from Tsinghua University, China. Prior to joining Stony Brook University, I was an assistant professor at Emory University. I was a research scientist at Siemens Corporate Research (Princeton, NJ) before joining Emory University. My research goal on big data management and analytics is to address the research challenges for delivering effective, scalable and high performance software systems for managing, querying and mining complex big data at multiple dimensions, including 2D and 3D spatial and imaging data, temporal data, spatial-temporal data, and sequencing data. My research goal on biomedical informatics is to develop novel methods and software systems to optimize the acquisition, extraction, management, and mining of biomedical data with much improved efficiency, interoperability, accuracy, and usability to support biomedical research and the healthcare enterprise. I received an NSF CAREER award in 2014. I will provide a couple of advanced projects (CSE523/524) and directed studies (CSE593). Projects include: 1) Big data management (spatial and temporal data); 2)Data science (social media data analytics for healthcare); 3) Deep learning for medical imaging; and 4) Blockchain for healthcare. Feb 5, 2018: CSIRE Program (2018) for K12 Students at Stony Brook University. We are excited to announce the "Computer Science and Informatics Research Experience Program for K12 Students" (CSIRE) 2018 at Stony Brook University. The CSIRE program at Stony Brook University is an opportunity for qualified, academically talented and motivated K12 students interested in pursuing a career in Computer Science or Informatics. The program provides the students a unique research experience working with leading researchers in the field. January 23, 2018: Our summer high student Kavya Kopparapu is named a Finalist in Regeneron Science Talent Search. Kavya Kopparapu, a summer student in Simons Summer Program of Stony Brook University, mentored by our lab, has been named a top 40 Finalist in the 77th Regeneron Science Talent Search—the nation’s oldest and most prestigious science and mathematics competition for high school seniors. Kavya will travel to Washington, DC in March to participate in the Finals Week competition. Finalists are each awarded at least $25,000, and the top 10 awards range from $40,000 to $250,000. The top 10 Regeneron Science Talent Search 2018 winners will be announced at a black-tie gala awards ceremony at the National Building Museum on March 13, 2018. More information is in the news. January 22, 2018: I am teaching a new CS course "Introduction to Biomedical Informatics". I am teaching a new undergraduate CS course CSE393: Introduction to Biomedical Informatics. cover the basis of biomedical informatics, including biomedical and healthcare data management and standards, medical imaging informatics, medical image analysis, bioinfromatics, and public health informatics and GIS. December 14, 2017: Yanhui Liang successfully defended her Ph.D. dissertation. Yanhui Liang successfully defended her dissertation on "Integrative Image and Spatial Analytics for Three-Dimensional Digital Pathology". She will join Google Brain. August 29, 2017: We have three full papers accepted to SIGSPATIAL 2017.
iSPEED: an Efficient In-Memory Based Spatial Query System for Large-Scale 3D Data with Complex Structures. SparkGIS: Resource Aware Efficient In-Memory Spatial Query Processing. Effective Scalable and Integrative Geocoding for Massive Address Datasets. May 31, 2017: CSIRE Program for K12 Students at Stony Brook University. We are excited to announce that we started a new program "Computer Science and Informatics Research Experience Program for K12 Students" (CSIRE) at Stony Brook University. The CSIRE program at Stony Brook University is an opportunity for qualified, academically talented and motivated K12 students interested in pursuing a career in Computer Science or Informatics. The program provides the students a unique research experience working with leading researchers in the field. January 31, 2017: NSF REU Opening: Exploring Scalable Data Analytics for Big Data at Stony Brook University. I am looking for a highly motivated undergraduate student with CS or informatics major to work on an NSF sponsored project on Research Experiences for Undergraduates (REU). If you are interested, please submit your application at SPIDAL REU at Stony Brook University . January 25, 2017: We are organizing the Third International Workshop on Data Management and Analytics for Medicine and Healthcare (DMAH'2017), in conjunction with VLDB 2017. The workshop will bring people cross-cutting the fields of information management and medical informatics, to discuss innovative data management and analytics technologies highlighting end-to-end applications, systems, and methods to address problems in healthcare, public health, and everyday wellness, with clinical, physiological, imaging, behavioral, environmental, and omic- data, and data from social media. The workshop will be held at Munich, Germany on September 1, 2017. 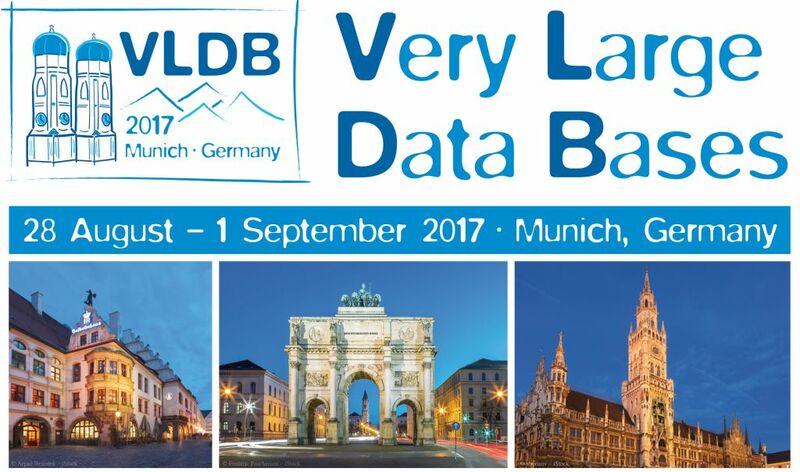 The workshop is in conjunction with the 43rd Very Large Databases Conference (VLDB 2017). January 1, 2017: ACM Technews on industrial adoption of our GPU accelrated spatial querying methods. ACM TechNews featured our research on GPU accelerated spatial querying methods, which are adopted byFixstars Solutions Inc for their geometry compuation engine. The work (published in VLDB 2012) is in collaboration with the Ohio State University. 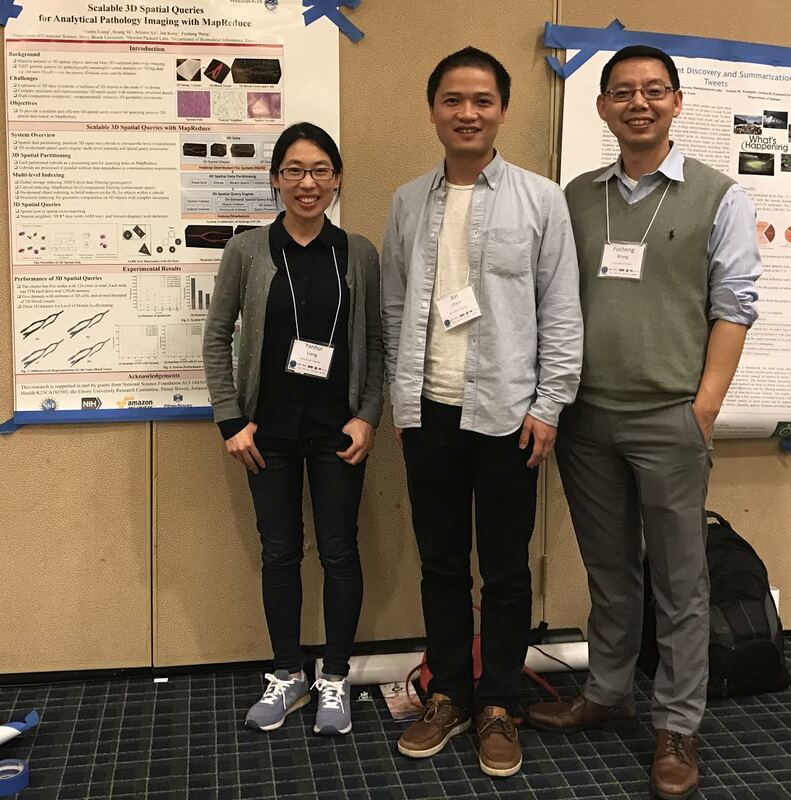 November 2, 2016: Yanhui Liang won the best poster award at SIGSPATIAL 2016. 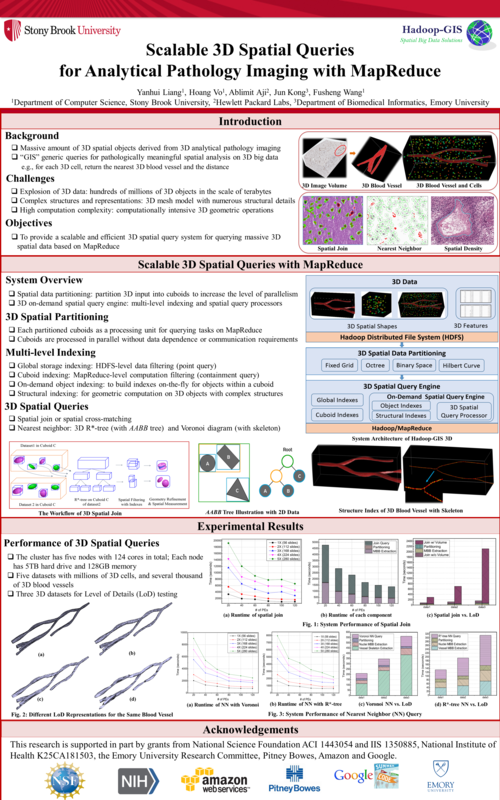 Yanhui's paper "Scalable 3D Spatial Queries for Analytical Pathology Imaging with MapReduce" won the best poster award at SIGSPATIAL 2016. June 10, 2016: I will teach CSE532: Theory of Database Systems this fall. This course covers recent advances in data management systems. Topics include complex queries and optimizations, XML data management, spatial data management, distributed and parallel databases, NoSQL databases, and MapReduce based data processing systems. We will discuss the foundations of data models, transaction models, storage, indexing and querying methods for these data management systems. We will demonstrate real world databases with biomedical data, geospatial data and/or social media data.